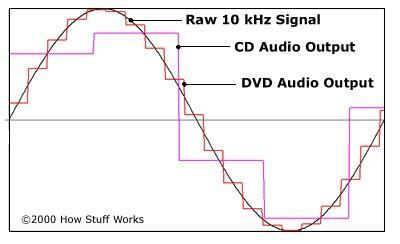 This chart displays the differences in raw analog audio signals between different mediums for audio. What are the odds that I would be listening to a newly thrifted vinyl record right before reading Jonathan Sterne’s “The mp3 as Cultural Artifact”? After reading the article, I began thinking about music quality. I was a bit surprised that the article appeared to neglect adding vinyl into the conversation. I personally enjoy vinyl records simply for the novelty of listening to something that my grandparents probably listened to almost a century ago! When I walk into any music shop, however, the “professionals” love to strike up a conversation on how the music quality is way better on vinyl than anything else you will listen to today. I nod my head in clear agreement, but I never really took the time out to understand why music quality appeared to be better on vinyl and what “better’ even meant. The graph above gives the visual representation of sound quality through different mediums. In the article linked to the photo, it claims that “a vinyl record has a groove carved into it that mirrors the original sound’s waveform…[so] the waveforms from a vinyl recording can be much more accurate, and that can be heard in the richness of the sound”. Posted on October 18, 2017 Categories Group BTags CDs, Dig101, DVDs, MP3, music, music quality, quality, vinylLeave a comment on What is “Good” Music?